Home / Columnists/ ‘Good governance’: waiting for Godot? and other fairy tales! ‘Good governance’: waiting for Godot? and other fairy tales! There’s something akin to the fairy tale romance about Sri Lanka since January 2015. We’re a tad like the princess imprisoned atop a tower, pining for a true knight in shining in armour to ride up and rescue us. First we needed rescuing from an ogre and its associates, both kith and kin, who had thrown the land in thrall. Then we wanted to be rescued from the king, the crown prince, and the queen (I’m not saying who is what or which is which) who rode up and rescued us. And if we’re honest many of us will remember hero-worshipping the ogre at a time when he and his military might looked very much like the stuff legends were made of – and we were truly gobsmacked and grateful that he had once rescued us from a wicked hobgoblin of the north who had turned a green and pleasant country into a wasteland. If we really scrape the bottom of the barrel, some of us will even admit to considering the wicked hobgoblin himself a dashing deliverer of the oppressed. At least for a while before the bombs started going off in our capital city and the ideological war turned into terrorism in our startled minds. I think you see where I’m going with this… We all live in cloud-cuckoo-land… where one man’s vicious terrorist was another’s triumphant victor – and vice versa. Today we’re still waiting to be rescued from our successive cohorts of rescuers. With Prince Charming & Co. looking increasingly like Brer Fox, Brer Wolf, or Mr Toad of Toad Hall – and that ogre rattling his, well whatever ogres rattle in the place of sabres, in the background. Point is we princesses are hard to please. And maybe even harder to rescue. Perhaps because our champions are not interested in our virtue for a lifetime of companionship but our momentary vote and the pleasure of conquest. Theirs, not ours; for we live and survive if not thrive in a topsy-turvy-dom where people’s servants become their lords. Enough already; I’m done with allegorising governance – good, bad or ugly, or otherwise. As if metaphor will make matters better rather than worse! However much nothing happens (“nobody comes, nobody goes, it’s awful”) – like the petty politicos who remain in power and in clover no matter which party is in or what principles out), like Vladimir and Estragon, I suppose one must be grateful for small mercies. Cabinet shuffles are nodding distantly to the notion that Caesar’s “wife” and other members of his household must not only be above reproach but be seen and heard of to be above reproach. Disaster management jokers are cruelly pilloried along the grapevines and jungle telegraphs, so at least the polity’s sense of relief in and through their collective sense of humour is tolerated – although it seems a favour, the joke may eventually be on us? Abductions, murders, disappearances have been wiped from the face of the city’s fears and the town’s sleepless nights – although reports that more than merely the village idiot is routinely tortured in police custody must disturb the midnight repose of advocates of civil liberties, even if the justice minister sleeps the sleep of the just? Just so! Just so that you know we realise that “it’s the economy, stupid” – we are well aware that tender-minded philosophical approaches to growth, development, and progress notwithstanding, it is principles and values that undergird Sri Lanka’s prospects as an emerging middle-income nation. While previous regimes might have demonstrated themselves better (in the short term) at building roads and bridges, the incumbent administration arguably has a better handle on the globalist animal who fetches the ball we throw – not because the beast likes fetching the ball… but because it suspects we like throwing it. Or vice versa. And even if the current governing coalition’s puerile attempts to plaster the cracks of its policies – and its hideous volte-face on its cherished values when in power vs. loudly espoused principles while in opposition – smacks of hypocrisy, we are grown up enough as a polity to understand what is par for the course for poorer countries caught between western neo-colonialism and the imperialist ambitions of neighbours and regional powers. We believe in free speech – even if, especially if, it means we have to swallow the tripe that politicos too craven to admit they were wrong or misguided about China (or merely mistaken about the hoo-hah they made) now dish out at seminars where they play to the gallery by inveigling India to attend. Say on, Macduff! Lay it on – thick! Be all these as they may, the bitter pill is that even under the rule of democratic-republicanism – perhaps especially under the rule of men entirely liberal in their approach to free speech – chauvinists of many stripes and jingoists of every ilk are at large and tolerated sufficiently to spew vitriol and incite the lighting of violent flames fanned by ethno-nationalism. Maybe I’m being charitable; for the rumour mill is working overtime on which powerful figures in government at present (or what former members of the deep state that penetrated the system with intimidation, fear, and loathing) are championing the mad monk’s cause and liberty from behind the scenes. Some have it that angels ministering justice are in favour of this irreligious Rasputin. But others say the most bureaucratic of the Rajapaksa clan is the chief defender of him who cries havoc and threatens to let slip the dogs of war on Colombo’s mean streets and minority-thronged boroughs. To a mean-spirited warmonger who lives by his wits and the wishes of arsonists, the saffron is an affront and spirituality an absurdity that passes all understanding. We are all born mad, as Samuel Beckett inferred. Some remain so. And the rest of us go to hell with the hounds if we don’t protest early or often enough at the rabidity of the few whose mania is grist to psychotic mills. Allegory may be a good place to which to return when the straight-talking plain-speak of what could or should have been a more lucid meta-narrative fails. Once upon a time, a wicked hobgoblin terrorised the land. But an orc and his band of brothers managed to wage violent war and rid the kingdom of that menace. In power the orcs soon proved to be ogres. So the people pined like princesses atop a tower for a knight in shining armour to rescue them. A king, a crown prince, and a queen (guess which, folks) saved to deliver the service element expected of their nobility. But since Noblesse Oblige (and all that), soon enough the nobles were back to obliging themselves, their brethren and offspring, their blue-eyed boys. And the saffron-robed dwarves of darkness made capital of the democrats’ distress by unleashing the demagogic dogs of idiotic ideological warfare. Maybe through no fault of their own, the republic’s new royalty slowly and surely became the villains of the piece; by dint of their apathy, ignorance, weakness and (in part) cupidity as well as personal ambition. Perhaps it is they who need rescuing now – from their allies as well as their enemies. Therefore let the princesses atop the tower let themselves down from their keep by virtue of their own hair, ride hard and true to the dolorous dungeons where Good Governance lies wounded, imprisoned, weeping, and rescue it with valorous acts made possible in this milieu by the marvellous magic of the right to dissent, the space to critically engage, the power of 19A and RTI and other liberating laws of the land that strengthen and safeguard, the glory of an independent mass of people vouchsafed state thuggery as much as separatist terrorism! 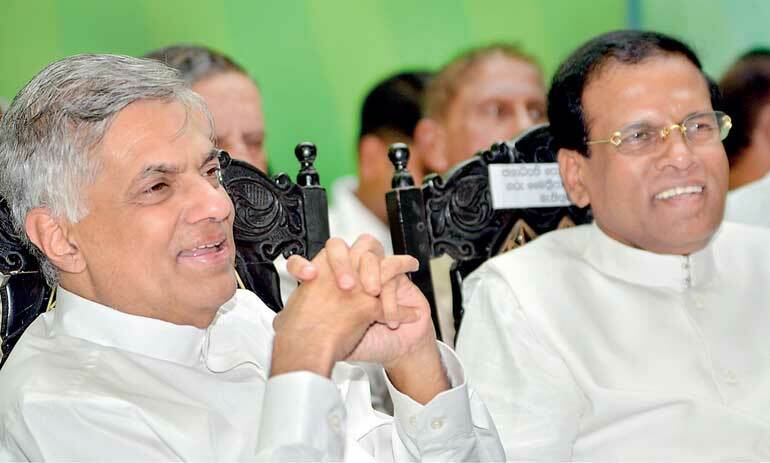 Therefore let the peace that passes all understanding come to rest and reside in the republic again, and the grace of Good Governance no longer make the people wait for Godot or the not so tender mercy of the Mahinda brigade of orcs and ogres. Habit is a great deadener – and if there is one penchant or proclivity we need to kick, it is the predilection to wait for the next polls to sort out all our stuff. No, folks, the time is now! But the opportunity is slipping away… And yet it is the silent majority of electors – civil society as much as common or garden voters – who have the power of the future ballot. We must hasten to the barricades before the semblance of civilisation we have enjoyed slips away as a vestige of an aberrant shift of power from the efficient grim to the gormless effete.